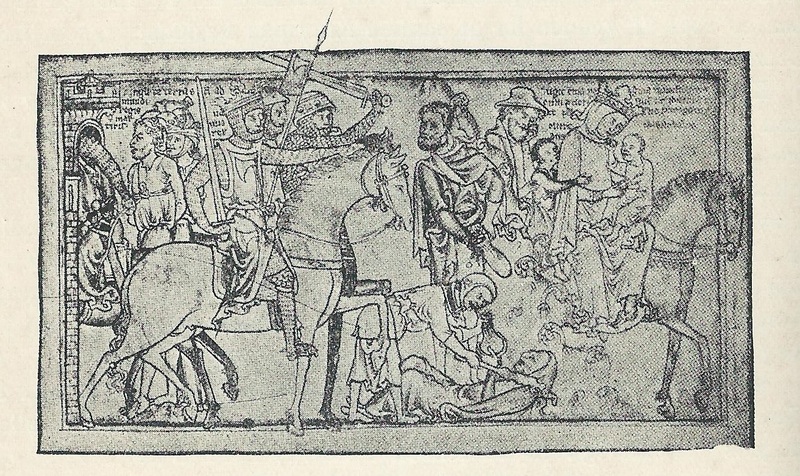 Drawing made by Mattheus Paris(dead 1259) King Sweyn on a horse, his men are looting, demanding taxes, imprisoning peasants. Queen Emma flees with her sons. Sweyn Forkbeard conquered England. In July of 1013, he arrived with a mighty fleet outside Sandwich. The separated and weak England was ready to fall. The vikings never met any serious resistance, after Sweyn Forkbeard conquered Northhumberland he was ready to conquer South England, Oxford and Winchester gave up without fighting. 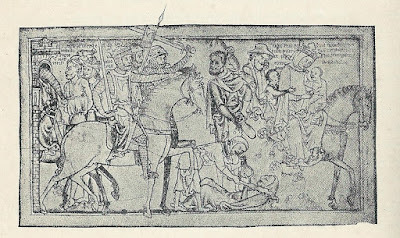 Only London was defended bravely by Thorkil the tall and his men, but in Wessex all English nobles gave and oath of obedience and loyalty to the Danish king and after that London gave up. The conquest was over and the establishment of the Danish North sea rule installed. On the 25th of December Sweyn was proclaimed king, the loser King Æthelred the unready fled to Normandy where his queen Emma and his sons lived with her brother, Richard 2 of Normandy. It certainly was not a good asylum, for Æthelred the unready. The duke of Normandy had a good relationship with Sweyn Forkbeard.